Munich - For football's world, European and various national governing bodies, fair play is a central and much-promoted tenet. At the cutting edge of the modern professional game, a ruthlessly competitive and extremely lucrative arena, the lines can, however, often seem blurred to the observer, neutral or otherwise. Gamesmanship in its many forms has been cultivated to a high art and at times seems almost to have taken on the dimension of an added tactical option. The sheer speed with which a top-level contest now shifts from one end of the pitch to the other, combined with an ever-decreasing margin of error in all areas, invariably leads to difficult, split-second decisions falling to the referee and his assistants on a regular basis. In the Bundesliga, with no video evidence to fall back on, it follows that they will sometimes get it wrong and when they do, the disadvantaged party as a rule just has to swallow the bitter pill and get on with the job. At the Grundig Stadium last Saturday, though, things panned out a little differently. The Matchday 24 meeting of 1. FC Nürnberg and SV Werder Bremen had all the hallmarks of a real relegation dogfight, with two points separating the 14th-placed hosts from their marginally better-off northern visitors. A tight and rather scrappy contest duly unfolded, in which Nürnberg showed the greater attacking purpose overall, only for Bremen to ultimately prove the more clinical in front of goal. But it is for a couple of moments of fair play above and beyond the call of professional duty that this particular encounter will likely be best remembered. The first and objectively lesser of the two good deeds was notable enough in its own right. With both sides cagily jousting in search of the breakthrough, Nürnberg's Hiroshi Kiyotake and Bremen centre back Sebastian Prödl went one-on-one inside the Werder box and when the ball flew behind the goal, referee Manuel Gräfe awarded the home team a corner. Prödl and the other Werder players in the vicinity vociferously protested, a not uncommon scene in any game. On this occasion however, a short verbal exchange with Kiyotake was followed by Gräfe reversing his decision, giving a goal-kick to Bremen and a brief thumbs-up to the Japanese playmaker, whom Prödl also sought out for a handshake. “The defender asked me (who touched the ball last). I didn't think it would alter the decision, but I said it was me. The ref was nearby and he overheard it,” Kiyotake explained later. Franco Di Santo subsequently fired Bremen in front before the interval and when Philipp Bargfrede made it 2-0 against the run of play with just over 20 minutes to go, the game appeared to have pretty much run its course. Then, with a quarter of an hour to go, the guests broke down the left and Zlatko Junuzovic teed up Aaron Hunt, who surged into the box and went spectacularly to ground after making seemingly minimal contact with Nürnberg's Javier Pinola. Head coach Robin Dutt agreed, saying, “I can only doff my hat to that - and to Kiyotake as well.” Hunt had been close enough to the latter incident to hear Kiyotake's own admission first hand. 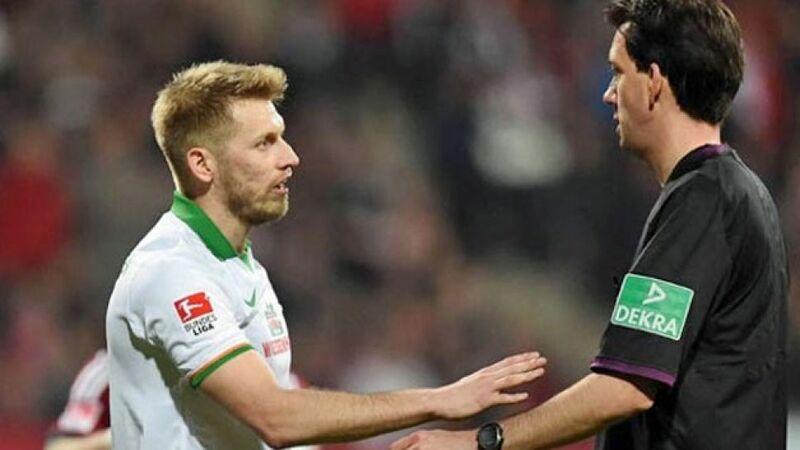 Whether that acted at least subconsciously as a partial catalyst for his own good deed later can only remain a matter of speculation, but if such moments of fair play do start to prove contagious in the Bundesliga and elsewhere, Manuel Gräfe and his fellow referees will certainly not be complaining.